Upcoming Research Teaser: What do Employers Want in a Corporate Social Media Strategist? Altimeter Group is doing thorough research on the role of the Corporate Social Media Strategist. I’ve got bits of data below, and a bunch more coming. Who are these people? The Corporate Social Media Strategist are are decision makers of social media within an enterprise corporation over social media programs. In fact, I have a growing list of actual Corporate Social Media Strategists right here. Our research will involve surveying them, analyzing job descriptions, analyzing LinkedIn Profiles, looking at HR salary information. Beyond that, we’ve completed 49 interviews over the past few months of strategists and those they work with, that’s right, 49 to find out what works and what’s keeping them up at night. 76.4% request a Bachelors degree. 11.7% prefer (yet most don’t require) a MBA. The primary segment of requested degrees is in the area of focus of Communications, Journalism or English. The second segment of degrees was closely followed by either Marketing or Advertising degrees. Thirdly, a handful had web, technical, IT, or general business degrees requests. Now to be clear, that’s just what employers want, that’s not actual reality. We’ll be comparing what employers want –vs what real strategists actually do in our report. It’s interesting stuff, and part of our research will to analyze and compare what employers want –vs what really exists from these actual professionals. What else will this report answer? Are you a corporate social media strategist and want to take the survey? We are seeking actual social media decision makers at brands and corporations, if you fit this category, please sign this form and we’ll email you the survey. Do you want us to email you the full no-cost report when it’s available? Sign up here to receive the no-cost Altimeter report, you can read much of my previous research on my research tab on my blog, look up, or view research. Caveat: The above data should be assumed draft, wait until the final report comes live for all the detailed info. In this continued digest of job changes, I like to salute those that continue to join the industry in roles focused on social media, see the archives, which I’ve been tracking for a few years. Kaiser Kuo, a respected global peer, founder of China’s iconic rock band Tang Dynasty, has joined the Chinese and Japanese search engine company, Baidu Inc., and serves as the international media public relations director of the investor relations department. Michael Chin, who I’ve worked with extensively on projects joins SocialFlow	VP, Marketing He’ll focus on bringing SocialFlow to market and help customers communicate better on the social web. Dave	Knox joins Rockfish as Interactive	Chief Marketing Officer I will help Rockfish to be a Digital Innovation Partner for our clients, working with them to understand and embrace the opportunities created by an increasingly digital world. Bryan Radtke joins Rockfish as Interactive	Vice President of Strategy	Lead strategy and execution with clients. Lena	Shaw, who I’ve met a few times and have been impressed, joins UCSF	Social Media Marketing Manager	Develop UCSF’s presence in social media circles. Jessica	Smith joins Planit as Director of Social Influence	Smith will lead the social influence team in the development of best-in-class word-of-mouth and social media campaigns. One of her first priorities will be to integrate social and WOM strategies into clients’ existing campaigns. Matt	Savarino joins ESPN.com as Community Developer	Responsible for guiding and implementing the technical direction of the suite of ESPN Community products including Conversations, Message Boards and Profiles. Ryon	Harms joins Farmers Group as Director, Social Media	Leading all social media initiatives both for corporate and more than 15,000 independant agents. At a recent engagement, I was asked to list out the benefits and risks for companies to participate and not, as you know, from our research on how companies connect with customers, the Engagement DB research found there are four types of companies: Wallflowers, Butterflies, Selectives and Mavens –clearly not all are doing it. 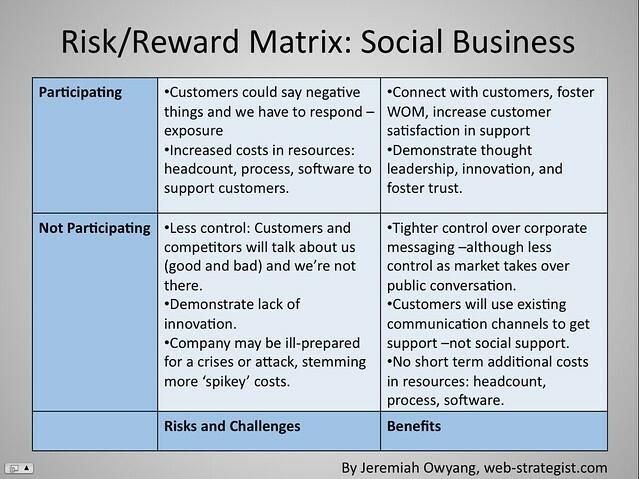 The scope of this matrix “Social Business” is when a company and their employees engage with customers in the social web, where customers, competitors, and prospects are already talking. In 2010, it’s assumed the conversation in your market in the social web is already happening. Like all investments, there are risks and rewards, use this matrix to help decision makers understand the downsides and upsides by participating. For more like this, see all my posts tagged ‘matrix’. Feel free to use this matrix in your work, kindly provide attribution. Feature Showdown: Twitter 3, Facebook 4. Cowritten by Chris Saad (@chrissaad), and Jeremiah Owyang (@jowyang). Twitter has announced a new redesign today, yet by looking at the news, there hasn’t been a detailed breakdown of these two leading social networks. Overall, Twitters new features start to resemble some features of a traditional social network, beyond their simple messaging heritage. We took the key features from both social website and did a comparison and voted on the stronger player. Above: Click image to see notes about the new Twitter features. 2) Discussion and Reaction Management Facebook’s conversation features thread the discussion and comments inline in the stream, keeping conversations in context Users have to click on a tweet to see the reactions to that tweet in the newly expanded right column. Includes retweets and @ replies. Other participants that are not following each other do not see each others’ comments before participating. Our call? Facebook. FB’s sophisticated newsfeed model encourages peer to peer conversation, is different than Twitter’s broadcast model which encourages asynchronous responses. 3) Profile Features Facebook is slowly reducing the profiles features by removing heavyweight features like ‘boxes’ and ‘canvas apps’ streamlining the experience. Is beefing up their profile pages with ‘follow recommendations’ and ‘you both follow’ features, in order to encourage more interaction. Their dead simple features make it easy to self express, and offer a limited profile Our call? Twitter. While both these players are both meeting in the middle, with Facebook getting lighter, and Twitter is becoming more robust, Facebook’s features are excessive to most users, and simplicity trumps. 4) Application Platform Facebook has treated the platform as a proper product with developer relations (although often with challenges) viral distribution of the newsfeed, and developer ecosystem relationships. The application features are designed for third parties to quickly integrate using tabs. Over the past 12 months, Facebook has aggressively changed their strategy to encourage developers to spread the APIs to third party sites (vs only embedded on profile pages) , expanding Facebook’s colonies to the open web. This loose strategy has been adhoc with simple APIs without formal development initiative with no hooks to integrate apps into Twitter.com. In fact, Twitter only recently hosted their own developer conference this year. The relationship between Twitter and the developer community remains torrid, as they buy or build features from the developer community. For example, the latest release today, threatens the functionality of many existing clients. Our call? Facebook. FB is focused on a land grab for third party real estate, Twitter appears to be cannibalizing their own B2C developer ecosystem. 5) Multi Media Integration Media, such as video, is loaded and embedded right in the stream, as well as in stream playing. Third parties that inject media into the stream will embed into the service at will. 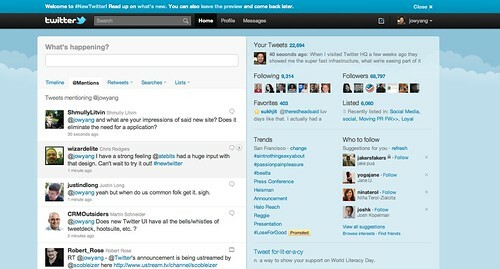 Twitter’s new media features requires users to click and open separate screen –although embedded media plays in panel. A business dev relationship must be established for media to be detected from target URLs. For example, only partners of Twitter that have approved media will be able to play embedded media in the Twitter stream. Our call? Facebook. Facebook makes it easy for users to consume media, and for publishers to spread it. They make it easy. 6) Location Platform Facebook recently launched ‘Places’ feature and data, that allows for users to checkin upon arrival at a locale. This is manual and opt-in behavior for each checkin. Twitter offers opted in users offers each Tweet a location payload. Each Tweet is an implicit checkin. Our Call? Twitter. Twitter is more lightweight and could have more location data per opt-in user, hopefully increasing context in the future. Our Verdict: While Facebook Leads, Twitter’s Redesign Strengthens as a Challenger. Twitter is Evolving Beyond Just A Simple Messaging Systems Into a Full Fledged Social Network. We tallied the important features of this launch and to their overall expansion strategy and have concluded that Facebook’s features continue to hold dominance over Twitter, despite the noticeable improvements. While we don’t expect that Twitter wants to become ‘another Facebook’ they should play to their strengths and remaining nimble and lightweight yet allowing for developers and content producer to better integrate into their system. One thing is clear, Twitter is enhancing their simple service with more features, which moves towards the feature rich experience Facebook offers.